Home » BC Network » Recent Updates » What Will We Do With A Cancelled Legion Of Superheroes? The New 45…. What Will We Do With A Cancelled Legion Of Superheroes? The New 45…. The word came out yesterday. 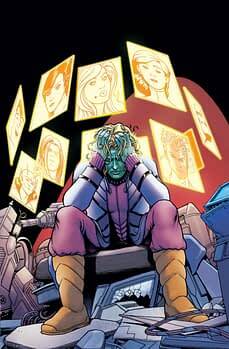 DC’s officially announced the end of the current run of the LEGION with #23…sad to see my old friends go, and hoping my tale for that issue with Kevin Maguire illustrating will be an honorable end. As a reader, I’ll miss them until their next incarnation, whenever and however that may come. As a writer, I’m privileged to have gotten three chances to work with this vast and wonderful cast, and now on to other projects and other worlds. To those of you who have supported my tales of the future since back when WONDER WOMAN debuted in prime time, Joe Namath played his last as a Jet, and the US thought Nevada was a reasonable place to test nuclear weapons…my thanks. Few of us get to play for so long in a world we loved as a child, and I’ll always appreciate the readers who made it possible. Not everyone was as sanguine. Forgive my momentary LSH freakout. I’m over it. I just wish DC supported/believed in the franchise, but they’ve not for decades. @dl316bh @janarrah Yes. Do you know why? BECAUSE IT’S NOT CALLED “THE SMALL BAND OF SUPER-HEROES,” ffs. Of course, Legion is not alone. Threshold, Demon Knights and Dial H joined it. The DC New 52 solicited 49 monthly titles for August. Four of which were cancellations. We now have a New 45. Obviously, that will not stand. What could replace them and make the numbers up? A four-times-a-month title may be a start. But, while creators were approached to work on a series of these, it seems they may have been postponed. Villains’ Month will make every comic an issue 1 again, renamed after the bad guy and gal in question, and a number of those books may continue as villain books. But there’s probably not going to be seven of them. So what might we get? Justice Legion? Booster Gold? The Question? Earth Two Batman? The Creeper? Something to bump up the Young Justice sub imprint, now down to just the Teen Titans?